List of unnamed Deep Space 9 residents. These children joined Keiko O'Brien's school aboard Deep Space 9 in 2369. According to the script, the Bajoran boy was eight years old, the Bajoran girl ten. The information that three of the kids are Human came from the script of the episode. According to the script all students in this episode range from age six to fourteen. It may be possible that one of the Bajorans was named Luta. A line from the script which did not made it into the episode stated that O'Brien wanted to see the algebra homework of Jake and Luta. The alien girl may be a native of Rekag-Seronia, as the makeup used for its inhabitants is nearly identical to the girl's. Most of the spectators were Bajorans, with a few Humans. They were played by unknown performers. Bashir, Garak and Ziyal were also present. This Bajoran was played by Peter Vogt. This Bajoran was played by stunt actor Tom Morga, who received no credit for this appearance. This Bajoran was played by stunt actor Vincent Mazzella, Jr., who received no credit for his appearance. 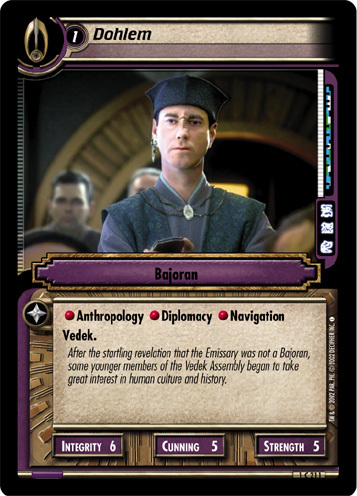 This Bajoran was played by Van Epperson. This Bajoran couple visited Quark's Bar in 2374. This Bajoran stunt couple was portrayed by stunt coordinator Dennis Madalone and his wife Linda Madalone. Neither received credit for their appearances. The residents were played by unknown performers. This Bajoran man was one of the residents aboard Deep Space 9 in 2369. This Bajoran was played by background actor Bob Harks who received no credit for his appearance. This Bajoran woman was a resident aboard Deep Space 9. This Bajoran woman was played by regular background actress Mary Mascari who received no credit for her appearances. This Bajoran woman was played by regular background actress Dorothy Hack who received no credit for her appearances. This recurring Bajoran woman was played by an unknown actress. She also appeared as an El-Aurian survivor in Star Trek Generations and as a Hospital administrator in the Ally McBeal first season episode "These Are the Days" in 1998. This recurring Bajoran was played by regular background actress and stand-in Susan Lewis who received no credit for her appearances. The Bajorans were played by unknown performers. This Bajoran was played by regular extra Mark Allen Shepherd, who also played Morn, and received no credit for all of his appearances. This Bajoran girl was played by an unknown actress. The lute player was played by an unknown actor. This Bajoran man was played by an unknown actor. The daughter was played by an unknown actress. This Bajoran woman was played by an unknown actress. The monk was played by Donald Hotton. The Star Trek Customizable Card Game gives his name as Prylar Mond. The novel Inferno identifies him as Prylar Rulan. Both monks were played by unknown performers. According to the Star Trek: Deep Space Nine Companion, one of the monks was played by the animal handler for the emus. This Bajoran monk was played by an unknown actor. This monk was played by an unknown actor. This Ranjen was walking on the Promenade and ringing the bell to announce services at the Bajoran temple in 2374. He was passed by Captain Benjamin Sisko who stopped and considered to enter the temple for services. The ranjen looked surprised at Sisko. When Sisko prepared to enter, he was contacted by Lieutenant Commander Worf over com and had to leave because of the arrival of Kai Winn Adami. The ranjen stood at the doorway of the temple and starred at Sisko until he left. This ranjen was played by an unknown actor. He was identified as ranjen in the script of the episode. The Star Trek Customizable Card Game gives his name as Shandor. He was played by regular background actor Mark Newsom, who received no credit for this appearance. This Bajoran boy was played by background actor Kevin M. Brettauer, who received no credit for this part. The Bajoran boy has his own article. The other Bajorans behind him were played by unknown performers. This Bajoran worked as a waiter in the Replimat aboard the space station Deep Space 9 in 2369. He served drinks when Doctor Julian Bashir and a Bajoran woman had a date at this location. This Bajoran waiter was played by an unknown actor. This Bajoran woman was played by Laura Cameron. This male Bajoran civilian lived on Deep Space 9 between 2369 and 2375. This Bajoran was played by an unknown actor who received no credit for his appearances. He was one of the regular background performers throughout the run of Star Trek: Deep Space Nine. The Bajoran shop owners were played by unknown performers. This Bajoran vendor was working at the jumja stick shop on the Promenade of Deep Space 9 in 2369. This Bajoran vendor was played by actor Michael Eugene Fairman. This Bajoran was played by stunt actor Cole McKay, who received no credit for this appearance. This Bajoran was played by stunt actor Red Horton, who received no credit for this appearance. This Bolian woman was a resident aboard Deep Space 9 from 2369 til 2372. She was a frequent guest in Quark's and was often seen on the Promenade. This Bolian was played by regular background actress Mary Meinel-Newport, who received no credit for her appearances. This Bolian female is possibly Lysia Arlin. This recurring Bolian was played by an unknown actor. This Bolian was played by uncredited extra Ken Gruz. These two Humans visited Quark's Bar in 2374. Both Humans were portrayed by stunt performers who received no credit for their appearance. This Human female was a resident on Deep Space 9 in 2369. This resident was played by regular background actress Tyana Parr, who received no credit for her appearances. This Human female was one of Deep Space 9's residents in 2369. This DS9 resident was played by regular background actress Holiday Freeman who received no credit for her appearances. This female resident was played by an unknown actress. This man was played by stunt actor George Colucci, who received no credit for his appearances. This Human male resided aboard Deep Space 9 for several years. This Human was played by Mark Allen Shepherd, who is better known for his portrayal of Morn. Shepherd received no credit for all of his appearances. This male resident was played by an unknown actor. He was played by recurring background actor Robert Cox. This Human was played by regular Broik actor David B. Levinson, who received no credit for this part. The Klingon chef was played by the late actor Ron Taylor. In several novels, the chef is known as Kaga (β). The name may or may not have been applied as a tip of the hat to Chairman Takeshi Kaga, host of the Japanese cooking television series Iron Chef, which debuted the same month that "Melora" initially aired. She was played by background actress Theresa St. Clair, who received no credit for this appearance. This Vulcan was played by an unknown actor. This resident was played by Stunt Coordinator Dennis Madalone.